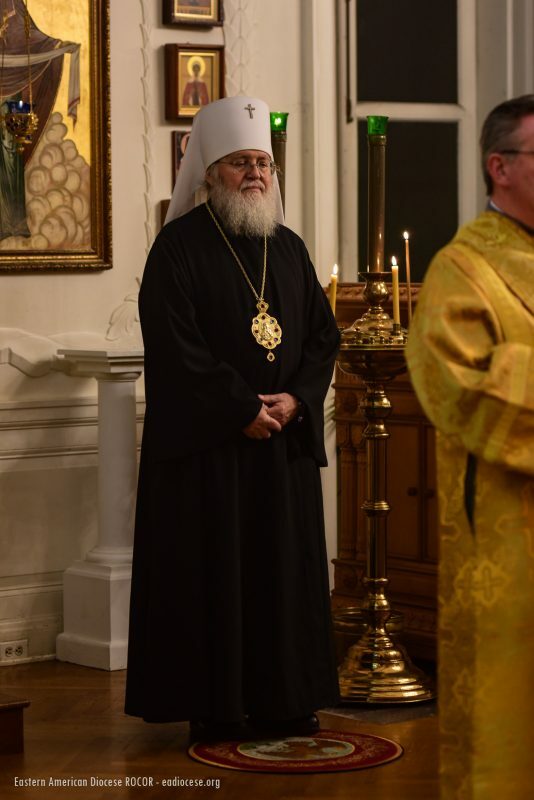 Clergy of the Eastern American Diocese, as well as parishioners of the cathedral and other churches of the Diocese, gathered to pray for the health of their archpastor. 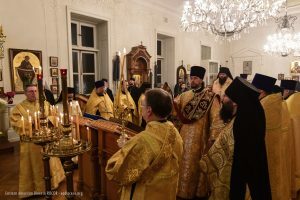 The moleben was led by Bishop Nicholas of Manhattan, co-served by diocesan clerics: Archpriest Alexander Belya (dean of New York City), Archimandrite Maximos (Weimar; abbot of St. Dionysios the Aeropagite Monastery in St. James, NY), Archpriest Andrei Sommer (cathedral senior priest), Abbot Vladimir (Zgoba; rector of Our Lady “Unexpected Joy” Church in Staten Island, NY), Archpriest Petro Kunitsky (cleric of New Martyrs & Confessors of Russia Church in Brooklyn, NY), Archpriest Alexandre Antchoutine (dean of the Hudson Valley & Long Island), Abbot Nicodemus (Balyasnikov; cleric of St. Nicholas Patriarchal Cathedral in New York City), Archpriest Dimitri Jakimowicz (rector of St. Nicholas Church in Stratford, CT), Hieromonk Silouan (Justiniano; cleric of St. Dionysios Monastery), Hieromonk Zosimas (Krampis; rector of the English-language mission of the Synodal Cathedral), Protodeacon Nicolas Mokhoff and Deacon Pavel Roudenko (clerics of the Synodal Cathedral), and Protodeacon Eugene Kallaur (cleric of St. Seraphim Memorial Church in Sea Cliff, NY). Praying at the moleben were numerous diocesan clergy. The moleben was served under the aegis of the Protectress of the Russian Diaspora, the Kursk Root Icon of the Mother of God. 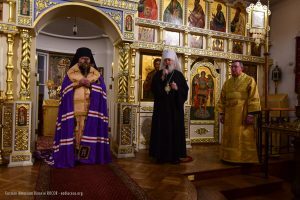 At the conclusion of the moleben, Bishop Nicholas congratulated Metropolitan Hilarion with his namesday, wishing him good health, saying, in part, “Today we commemorate the Holy Righteous Father John of Kronstadt. His glorification occurred 54 years ago in this cathedral. Among the Holy New Martyrs & Confessors of Russia, we especially honor the memory of the Venerable Nun-Martyrs Grand Duchess Elizabeth and Barbara. In our cathedral, we have a special reliquary containing the relics of Grand Duchess Elizabeth and Nun Barbara. “Today in the town of Rocky Hill, where the church is dedicated to the memory of St. Elizabeth, we celebrated their lesser patronal feast day and the 20th anniversary of the parish’s founding. This parish, much like other parishes in our Diocese, is flourishing under your wise leadership and attention. “Venerable Hilarion, among the numerous venerable saints who rest in the Kiev Caves with their incorrupt relics, shows us a great miracle. This shows their great holiness, which they gained through pray, through fasting, humility, and love. This name was given to me by the ever-memorable Archbishop Averky (Taushev) of Syracuse & Holy Trinity, rector of Holy Trinity Monastery in Jordanville.